story by Natalie Hope McDonaldIf Philadelphia hopes to become one of the greenest cities in America, now is the time. Thanks to two multi-million dollar grants from the federal government (distributed as part of President Obama’s Recovery Act), Philly is embarking on initiatives that will create green jobs, address energy concerns and offer sustainable solutions to some of the city’s longtime problems. 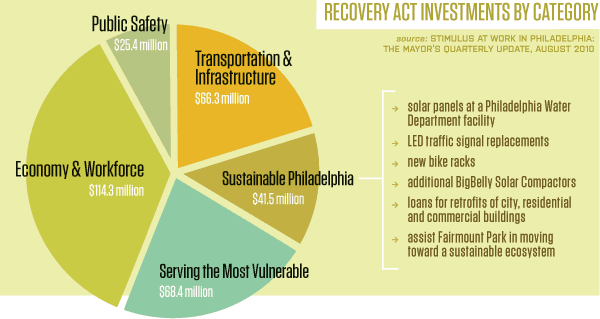 The mayor’s office recently published Stimulus at Work in Philadelphia: The Mayor’s Quarterly Update, detailing the goals of the Recovery Act and how funding is being distributed. According to Katherine Gajewski, Director of Sustainability for the City of Philadelphia, the money is mostly being used to help fund Greenworks, a citywide sustainability plan. Local businesses are receiving loans for energy-efficient projects, solar energy is being used to power garbage receptacles and a waste water treatment plant, and traffic lights are being replaced with LED signals, which could save the city upwards of $1 million per year on electricity costs. PECO has agreed to match the $3 million in funds allotted for the new lights. The bulbs will be swapped out before the end of the year. The city has taken a strategic approach in selecting recovery projects, ensuring strong alignment with Greenworks’ goals. “The city has been awarded a total of $41.5 million in sustainable-specific grants,” explains Maari Porter, Deputy Budget Director for Recovery. The city was also awarded a $15.8 million weatherization grant; more than 50 small businesses have already received rebates. Earlier this summer, a portion of the funds was used to install bike racks on former parking meter posts around town, making life easier for those who choose biking over driving. It was a great opportunity to reuse existing infrastructure in a more effective way.